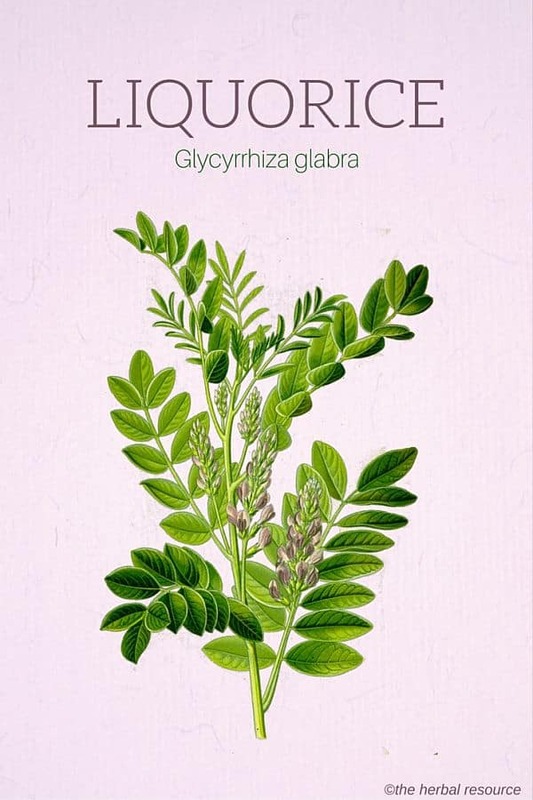 Botanical Name of Licorice: Glycyrrhiza glabra. Habitat: The licorice root is native to Southeastern Europe and cultivated in most of Europe. It prefers the open, dry areas with rich soil. It was first harvested from the wild until it was cultivated one thousand years ago. 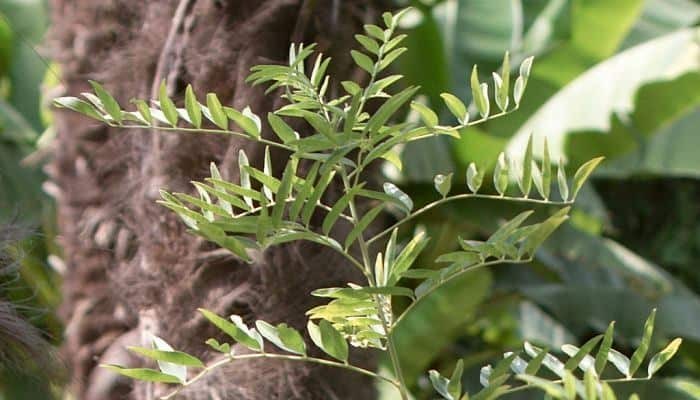 Plant Description: The licorice plant is erect, standing about 1.5 meters tall with spikes bearing lilac-colored flowers with bean-like pods containing three or four seeds. The main root (taproot) descends up to a meter into the ground and sends out a network of rhizomes. These roots and rhizomes are harvested after three to five years. The rhizomes have a woody appearance with a brown skin and yellow, fibrous interior. Plant Parts Used: The main taproot and the rhizomes are used in medicinal and flavoring applications. Licorice is one of the most widely used medicinal plants, both in Western and Eastern herbal medicine and has at least 3000 years of history as a medicinal plant. The plant contains various substances with different mechanisms of action. The saponins found in the herb act both as mucus thinning and expectorant. 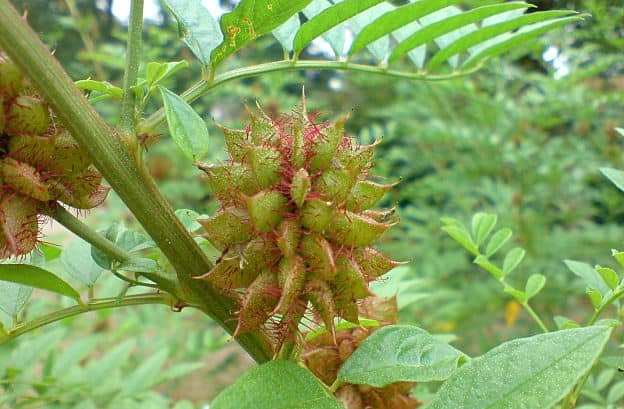 The viral inhibitory action of licorice is due to the substance glycyrrhizin that increases interferon formation, and the bacteria growth inhibitory effect is caused by the isoflavonoids hispaglabridin A and B and glabridin. Glycyrrhizic acid has an antispasmodic effect on the gastrointestinal tract, whereby the bacteria in the intestines is converted into a substance that acts as a liver-protective agent by neutralizing free radicals. The herb has also been shown to relieve rheumatism and arthritis. Scientific research shows that when glycyrrhizin is broken down in the stomach it displays inflammatory and arthritic-relieving effects similar to hydrocortisone and other corticosteroid hormones. It balances the production of the hormones (cortisol and adrenaline) in the adrenal gland and decreases the breakdown of steroids in the liver and kidneys. Japanese research conducted in 1985 showed that glycyrrhizin can be used in the treatment of chronic hepatitis and cirrhosis. Since licorice root may stimulate the adrenal glands, the herb can be helpful to treat Addison’s disease (adrenal cortex failure of hormone production). Licorice root lowers the acid level in the stomach and relieves heartburn and indigestion. It reduces the secretion of digestive juices and helps to create protective mucus in the stomach. This makes licorice a good remedy for ailments of the gastrointestinal system, from irritation, spasm, irritable bowel syndrome (IBS) and inflammation of gastric and duodenal ulcers. Some countries have experimented with licorice-coated aspirin to help reduce ulcers caused by aspirin use. The herb has a beneficial effect on the liver and it increases bile secretion and lowers cholesterol levels. In addition it is used as a medicinal herb for hypothyroidism, menstrual cramps, and regulating menstruation. It may, therefore, be useful in reducing the growth of the gland and help to prevent some of the symptoms associated with benign enlargement of the prostate. Licorice root is used internally as an herbal remedy for sore throat, cough, allergic disorders and viral infections. Glycyrrhizin is one of the best documented antiviral substances derived from the plant kingdom and has been shown to be effective against a variety of viruses, including those which cause influenza and the common cold. The antiviral properties of the herb are due to its ability to promote the body’s resistance to viruses and naturally boosting the immune system. Licorice root has been used as an herbal remedy for bronchitis and whooping cough because of its expectorant (used to loosen congestion in the upper airway) abilities. It may also stimulate mucous production and secretion in the trachea. Both glycyrrhizin and glycyrrhizic acid are substances with anti-inflammatory and anti-allergic properties, and this may explain the herb’s use as a remedy for hay fever, allergic nasal catarrh, conjunctivitis, and asthma. The herb works as well for high fever and as a pain reliever. Glycyrrhizin has been shown to inhibit several of the processes that allow viruses to multiply in the body, and some laboratory experiments have proven that glycyrrhizin can also inhibit the growth of the HIV virus but no clinical studies have confirmed that it’s a viable treatment for HIV. Glycyrrhizin also seems to lessen some of the side effects of conventional antiviral drugs currently used to treat AIDS and HIV. Licorice extract and powder are widely used in candy and flavoring of tobacco, snuff, beer, chocolate, soft drinks and some pharmaceuticals (especially laxatives). Along with anise (Pimpinella anisum), it’s an important ingredient in many cough syrups found in the pharmacies today. The flavor often associated with licorice is actually anise. Externally the herb has been used against dermatitis, eczema, herpes and shingles. 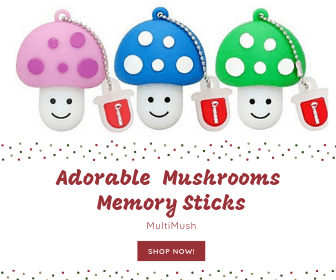 It has anti-fungal and anti-bacterial properties which explain its use as an herbal remedy for athlete’s foot, canker sores and dandruff. Licorice may come in an extract form or in root form. The extract can come in teas, capsules, tablets, and in combination with other herbal remedies. Since the side effects of licorice root are mostly related to the substance glycyrrhizin, most of the clinical research done on the herb is made with modified licorice extract from which most of the glycyrrhizin has been removed. 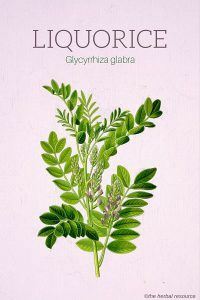 Deglycyrrhizinated licorice (DGL) is usually standardized to contain no more than three percent natural glycyrrhizin. The contents of glycyrrhizin in pure licorice root can be between one and 24 percent but usually is between six to 14 percent. The German Commission E accepts an intake of an average daily dose of 200 to 600 mg glycyrrhizin, which corresponds to five to 15 g of licorice. As a treatment for ulcers, a dose of 1.5 to three g of licorice root daily has been recommended. The maximum dose of glycyrrhizin licorice when used as a flavor ingredient in food and beverages, should not exceed 100 mg per day. Licorice root should not be used by people with anemia, high blood pressure, severe liver or kidney disease or those taking digoxin-based, diuretics or digitalis glycoside heart medications. The herb should not be used in hypokalemia, liver cirrhosis, hypertension, and severe renal insufficiency. Licorice root is advised against during pregnancy, but no studies have been made regarding the use of licorice root during lactation. The side effects do seem to be dose dependent, with smaller doses having lesser, or no, side effects. Large amounts of licorice root taken over an extended time period can interfere with sodium/potassium balance and cause fluid retention (edema), high blood pressure, headaches, dizziness and heart problems. The herb should not be used therapeutically for more than 4-6 weeks without the supervision of a qualified healthcare professional. Bown, Deni: The Royal Horticultural Society New Encyclopedia of Herbs and Their Uses. London, England. Dorling Kindersley 2002. McKenna, Dennis J.: Natural Dietary Supplements: A Desktop Reference. Marine on St. Croix, Institute for Natural Products Research 1998. Lewis, Walter H. & Mempry P. F. Elvin-Lewis: Medical Botany. Plants Affecting Human Health. Second Edition. Hoboken, New Jersey. John Wiley & Sons 2003.